Our Border Security Force, which deployed 30,000 additional force, has led to a major crackdown in the cross-border cattle and beef trade. 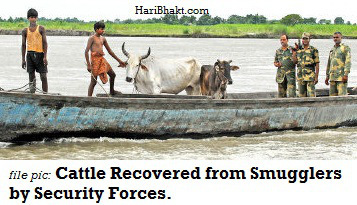 Cattle smuggling is down over 70% and beef prices have gone up a lot in Bangladesh and some smugglers have been shot in the act. Now Bangladesh is protesting or should we say begging India to lift this. But – how can we? In our culture, we save and protect cows and cattle.